This is a popular one. I’ve never recommended this to someone without having them tell me they ended up loving it. Basically, this lets you customize light-up auras on your screen that respond to pretty much anything in the game. Standing in the fire? Write a power aura to tell you about it. Abilities off cooldown? That too. Manage a rotation, monitor buffs and debuffs, track trinket procs, inform you when your pet/main tank/etc. is low on health. This is just the surface. It’s infinitely customizable, and frankly a lot of fun to use. Below is a screenshot of my hunter with her “standard” power auras up. I have other ones for unique situations, but this is what I’m generally looking at while raiding (never all at the same time, however). 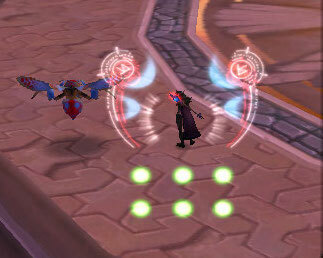 The larger ones monitor large proc-based buffs so that I can stack cooldowns. And the green dots track my rotation shots, so I’m never hitting the wrong button or staring at my cast bar. The only drawback is that there’s a small learning curve. Once you figure out how to customize them, it’s cake, but it takes a little while to get there. But for its potential usefulness, it’s a small price to pay. Several satisfactory tutorials exist with a simple google or youtube search. PowerAuras has a wiki that is decently maintained. I’ve switched over to PowerAuras for almost every alert or timer I need in the game. The nice thing about PowerAuras is that you can consolidate addons using it. Not only can it track my relevant buffs, but it can also track debuffs on both yourself and your target, cooldowns and spell availability, and misc procs. And all of it customizable to an aesthetically pleasing and/or eye grabbing alert. Good stuff! Power Auras is made of win.